A couple of Saturdays ago, I had made plans to have some of the chaps round for dinner. It would be an all male affair and I was keen that the food reflect this. Having watched Braveheart only a few days before (which unbelievably Laura, 26, had never seen), I could not think of a more suitable theme than Scottish. I also wanted game to play a part. Another forbidden meat group during our midweek cooking, a dispute I often cry freedom from as I cut into yet another chicken breast. It didn’t take me long to find the perfect recipe. One that I envisioned garnering sagely nods of approval in a dimly lit room, around a table strewn with empty glasses, heroic tales and half-baked banter. 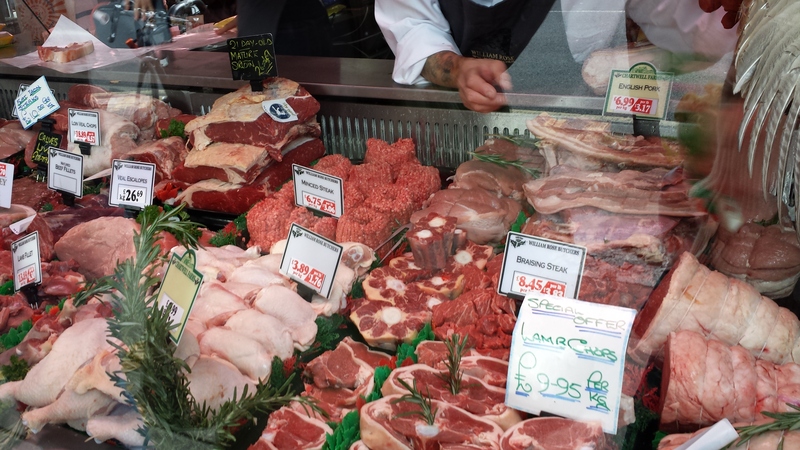 It so happened that the Saturday coincided with us house hunting in East Dulwich so I took the opportunity to drop in on a butchers that I have often admired from afar but never actually been inside. 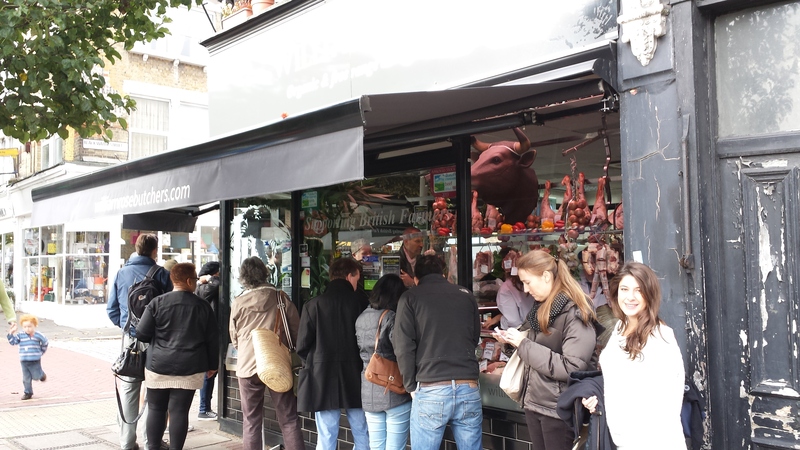 William Rose Butchers on Lordship Lane. Even though the queue was fairly sizeable (and having been back I realise now that it is every Saturday), to say I was not disappointed would be a serious understatement. Not only was the selection top drawer, the meat enticing and the produce all locally sourced but the real winner for me was the service. Incredibly helpful, friendly and (despite it being absolutely rammed) still very much up for a chat. Very different from our local butcher Moen & Sons that I’ve fallen out of love with over the two and a bit years I’ve lived in Clapham. After some pootling around houses and down potential roads, we ducked into The Palmerston (top pub) for a swift half, me clutching my pound of flesh. 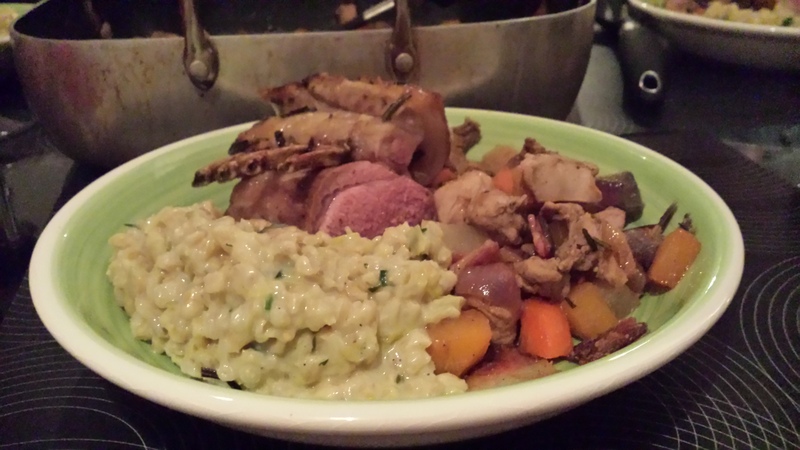 The food that evening I thought turned out rather well with the pearl barley risotto packing the surprise package. Creamy, cheesy and with a bit of al dente chew that tends to get lost a little in a lot of regular riced risottos when they are overdone even slightly. Have to say the pheasant and liver hash with a twist of bitter marmalade at the end really reminded me that Christmas wasn’t far around the corner. 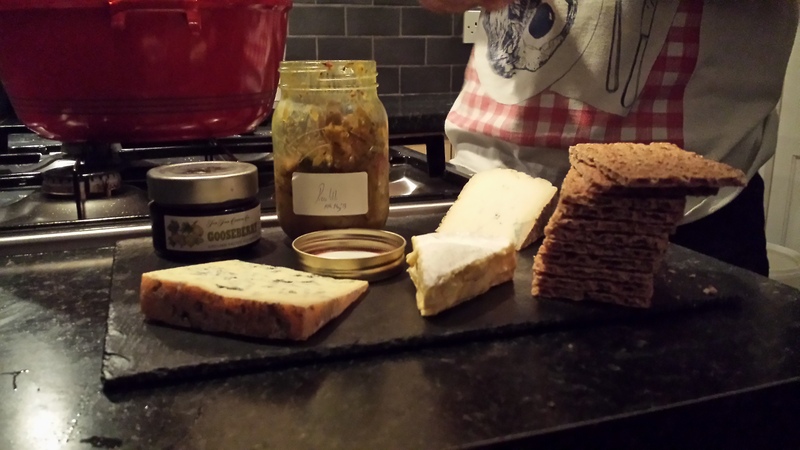 Piccalilli (no matter how delicious and homemade) does not go with cheese. Fact. We finished the meal with a cheese board and a bottle of port (sure). I imagine this caused Dyson’s cursory nap minutes later in the lounge. It was a carbon copy of about a year ago when he fell asleep in exactly the same position and fell foul of exactly the same fate.